Mission Planner (MP) is an open source ground station developed in C# primarily for use on Windows computers (although it can be run on Mac using mono). This is the most commonly used ground station as it provides the most complete functionality for vehicle setup as well as pre-flight mission planner, in-flight monitoring and post flight log file analysis. This page provides instructions on how you can build the Mission Planner software on your own machine using MS Visual Studio 2017 which may be useful if you wish to make changes for your own use or improvements for the community. Building the mission planner may also help as a guide in case you plan to build your own custom ground station development. Use your modified / complied version of Mission Planner at your own risk. C# programming skills and experience (at least or C++ experience). Experience with Microsoft Visual Studio (VS) development environment. MP is not the application to begin learning VS. Experience using Windows API (Application programming Interface) - including understanding of streams, processes, threads. Support for Visual Studio, programming in C# and Windows API may not be forthcoming from the DIY Drones community. You will need to get that support from other sources. Windows 10. Sorry earlier versions no longer work. Windows 7 etc will NOT work. The first step is to get Microsoft Visual Studio Community 2017installed and working in your Windows system. Download and install MS Visual Studio 2017 Community Edition which can be found here. During the install Process, you may be prompted to install optional “workloads”, at this stage, you may select: “.NET desktop development” ( or you may install it later… such as when you open the .sln for the first time, you’ll be prompted to do it). Install Python 2.7 (if not already installed) by downloading it here. We recommend you install this to the c:\Python27\ folder. Navigate to “Tools” Menu -> “Get Tools and Features” -> (wait for page load) -> Workloads -> Summary ( right of screen) -> then tick the tickbox labeled “.Net Core 2.0 development tools” ( leaving other tickboxes as-is) -> then click “Modify” button at bottom. wait for download/install to complete. you might like to test your installation on a simple “Hello World” application, or the “SimpleExample” described below. TIP: By default it is installed here: “C:\Program Files (x86)\Microsoft Visual Studio\2017\Community"
The Mission Planner source code is stored in GitHub. In general you can follow the instructions for the ardupilot flight code except that you should use the https://github.com/ArduPilot/MissionPlanner repository in place of the ardupilot repository. You could clone the git repo to (for example) c:\MissionPlanner\ but the exact folder is not critical. Navigate to where the Mission Planner source was downloaded to and open MissionPlanner.sln. Visual Studio should open the “solution” which includes the Mission Planner and a few other related applications (i.e. “3DR Radio”, “Updater”, etc) which can all be see in the Solution Explorer (highlighted in yellow above). Mission Planner is made up of several projects, you can see these by expanding the “MissionPlanner” and “ExtLibs” folders of the Solution Explorer. Before you attempt to build (compile) Mission Planner you must also have the official version installed on your PC. This is because there are some .dll files that are not included in the Git repository. Select Build >> Batch Build…, “Select All” (to check all checkboxes) and then press “Rebuild”. You will probably see errors on your first attempt to compile (build) Mission Planner so try a couple more times. Click the Add Folder button to put the path to the installed MP into the Reference paths box. Click (select) Build Events. Remove all pre-build and post build options. If any of the sub-projects says “(incompatible)” next to it inside Solution Explorer, then right-click that sub-project and choose “reload”, that should fix it. For errors about missing references, you will see the name of the project for each error listed. Select Properties for each project with such errors and add the location of the Installed Mission Planner like you did above for MissionPlanner project. That should reduce the errors. If you see an error in project BSE.Windows.Forms “..could not locate the Code Analysis tool at ‘’. You can eliminate this by un-checking the Enable Code Analysis box in Code Analysis in the BSE.Windows.Forms properties. In VS, Select menu items [BUILD] [Configuration Manager] This will show you which projects are compiled (built) each time you do a build or re-build solution. Do [Build], [Clean Solution] then [Build], [Rebuild solution]. All projects should build without errors. When you build without errors, you are ready to begin browsing or editing. 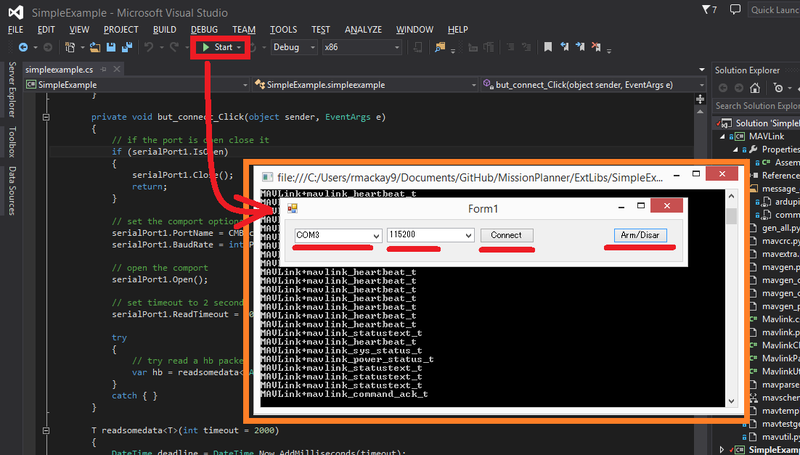 The “SimpleExample” solution is available as a near minimal application to demonstrate how a C# program can connect to a vehicle and cause it to arm or disarm. This example has many fewer dependencies than the full Mission Planner and is simpler to build and understand. Ensure the program can be build successfully by selecting Build >> Build Solution. After first checking that you can connect to your flight controller and arm it with the regular mission planner, disconnect the regular Mission Planner and then press “Start” to run the application in debug mode. When the “Form1” pops up, select the COM port, the baud rate (probably 115200) and press Connect. If it successfully connects, press Arm/Disarm to attempt to arm the vehicle. Editing and debugging details are beyond the scope of this Wiki. Debugging may result in some warnings. You should learn what they mean and take the necessary steps to resolve them if that is the case. Here is a simple debugging example to get you started. Do not (yet) connect your AutoPilot Hardware ( Pixhawk, etc ) to the compiled version of MP. You must first copy some .xml files to the bin/debug folder. See details below. First be sure VS is configured for debug (versus release) Set this in the top menu tools area or the configuration manager. Select menu DEBUG, Start Debugging. (Or, press F5). Mission Planner should run as you normally see it. However, some important configuration files are missing so connection to the AutoPilot Hardware ( eg Pixhawk, etc ) is not recommended at this time. Close MP. (Or, select menu DEBUG, Stop Debugging in VS). Next you can try setting a break point. 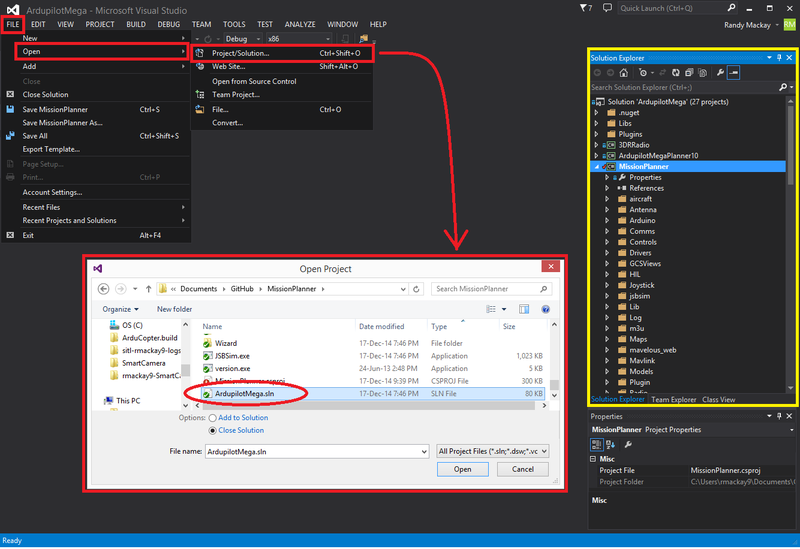 Expand the MissionPlanner project in the VS Solution Explorer so you see the objects included. Scroll down to MainV2.cs, right click that object and select View Code. In the code window for MainV2.cs, scroll down to the line “public MainV2” then to one of the first code lines after that ( currently it is a log.Info(“…”); line ) . Click in front of that line (In the dark gray bar on the left) to set a break point (red circle). You will see the normal MP start up windows up to the Splash window but then it will stop running. You have hit the break point. Visual Studio will show the code and the break point will be highlighted. Note that you cannot move the splash screen so you may need to relocate the VS window to see the break point. Move your mouse over different variables and objects in the code. You will see the current values of many or the items. Press F5 and Mission Planner will continue loading. Further details on editing and debugging are left to the user. If you make changes to Mission Planner, you will probably want to make use of your version. Here we will give you some preliminary information to do that. You can use your local compiled version but the compiled output files are located in different places in VS and some additional steps are required. There are configuration files specific to your installation of Mission Planner that are not included in the Git hub download that are only provided in the Mission Planner installation package. You will need to copy these to the correct area in the folder you are using for the Visual Studio project. Here are the steps that will get you started. Use your modified complied version of Mission Planner at your own risk. In order for your VS version of MP to function with the APM connected, you will need to copy several files from the folder where MP is installed (C:\Program Files (x86)\APM Planner or C:\Program Files\APM Planner) to the folder where your VS project compiled output is located. editors: This needs to be made more accurate which files are needed, why etc. I.E, if you solution is in folder MPGitClone, then copy the .xml files to MPGitClone\bin\Debug. Some will copy without notice, but some will ask you if you want to replace the existing file. Replacing all seems to work but you should investigate further to be sure you can use MP for real life situations before you do so. If you build Mission Planner in Release mode, then the files should be copied to the bin/Release folder. This has not been tested at this time. Location of Logs saved when using your version will be in the /bin/Debug or bin/Release folder. This can be changed with Mission Planner 1.2.63 and later versions. If you want to make a shortcut to run your version of Mission Planner without running Visual Studio, create the shortcut to point to the program ArduPilotMegaPlanner10.exe in the bin/Debug or bin/Release sub folders. At this point your local version of MP should be working. You should be able to connect to your APM, Flight Data including status should work, Configuration should bring up you APM parameters, Terminal should work including saveing and browsing logs. Flight Planner should also work. As mentioned before, use your modified version at your own risk. Create a personal Fork of the Mission Planner by going to https://github.com/ArduPilot/MissionPlanner and click on Fork (Upper right corner area) This creates a copy (fork) of Mission Planner files in your Git Hub account. Create a new branch in your repo and commit your changes and push these back to GitHub (these will only go into your repo on GitHub). The owner of Mission Planner (Michael Oborne) will receive an email notifying him of your Pull Request. He will most likely review, provide feedback and if he accepts the commit it will be added to master.